A new study from Jakob Nielsen suggests that average returns from usability work have fallen “substantially” in the last few years. The average ROI from the projects surveyed was 83% - down from 135% six years ago, but high enough to show that they are still well worth the effort. Most of the “truly horrible” websites, which in the past gave usability agencies plenty of opportunities to improve their design, have now been fixed, so it is now slightly harder to enhance the user experience. Even though the average website has improved over the last decade, the share of resources allocated to usability has stayed at around 10%. The survey measured RoI through typical metrics such as conversion rates, traffic numbers and user performance. Jakob says that 12% of projects still achieve major improvements (a rise by a factor of 10 or more), something that echoes the findings of our recent Usability Survey. In it, 45% of respondents reported that their organisation had netted an ROI of 300% or more from usability investment. So there’s still plenty of low hanging fruit out there, it seems. Shoppers using an e-commerce site have two main ways of finding the exact product or service they want – the navigation bar and the search box. While many sites have great navigation, there are plenty whose search options return some pretty poor results. Online marketers have long been focused on acquisition and traffic metrics. The key to staying ahead lies in the deployment of more sophisticated tools and techniques to boost income from landed traffic. Why is the Indie’s new website strangely familiar? 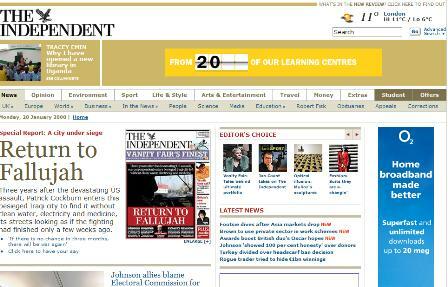 The Independent has completed a long overdue revamp of its website, placing more of an emphasis on multimedia content.